Even fictional people have to eat. Sometimes food reveals what we should know about a character, sometimes it’s a pleasant pause in the action, sometimes it’s a crucial staging platform for exposition, and sometimes it’s a hamburger for which you’ll be paid Tuesday. Food Fiction is an ongoing feature that looks at some of the most memorable foods in the history of storytelling. If you want to know about a cartoon character, pay attention to the sandwich. 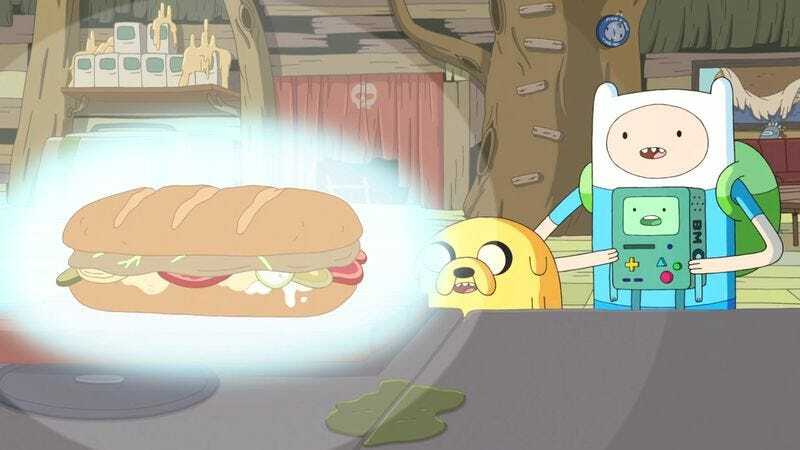 Assuming you’re a holdout and haven’t been watching Adventure Time, what can you determine about Jake The Dog from The Greatest Sandwich He’s Ever Made? Well, you might conclude he’s got spiritual and hipster tendencies, that he’s simultaneously ridiculous and serious (maybe ridiculous because he’s so serious), that his friendship with Finn The Human is full of mutual respect, that he’ll go to extremes for something he cares about, yet despite his worldliness and prowess he’s still vulnerable (due to his trusting nature and not being especially quick sometimes, which Magic Man takes advantage of). Also, this little recipe shows that Jake is not squeamish or unrealistic about the way the world works—which he demonstrates by using the bird from the windowsill for more than diced boiled eggs. It’s an important sandwich, and much has gone into it. It tells us a lot. But it’s just one example of an important cartoon sandwich. Sandwiches are a significant part of cartoon character-building and storytelling. Like blues song structure, the received basics of sandwich form are mostly predetermined and can’t be messed with a whole lot or you have something other than a sandwich: Creativity in the genre comes from the artist’s personal decisions and idiosyncratic style. The sandwich is an expression of who they are. So even though Jake The Dog is currently one of TV’s most prominent foodies, that sandwich sums him up best. In a way, though, the character in Adventure Time whose relationship to food is most important is Princess Bubblegum, the ruler of the Land Of Ooo, because the kingdom’s population is all food- or candy-based, and she brought most or all of the residents to life—still, when she decides to make a sandwich, it demonstrates as simply and clearly as anything her incredible scientific ability, confidence, disregard for answers that simple folk regard as obvious, tendency to do stuff the hard way, and general lack of real-world experience. Also, she trusts Cinnamon Bun way too much, revealing that she doesn’t always get social cues, maybe, or at any rate doesn’t care about them. Of course, the relationship between cartoon characters and food goes far beyond sandwiches. Food is a huge deal to kids, central to life and presumably something we’re not supposed to play with. For a bunch of iconoclastic storyboard artists and directors patiently subverting society in a cartoon studio, a character’s relationship to food can become a major part of understanding them: Homer Simpson’s a gourmand; the usually cheerful Paul Lynde-style bartender in The Misadventures Of Flapjack is wildly delusional, efficiently demonstrated by his desperate devotion to his motionless, out-of-context, not-even-a-cartoon candy wife. Flintstone ribs can flip your car over because they’re from a dinosaur. And Gromit’s owner Wallace fancies himself quite a connoisseur of cheese. But sandwiches are so useful, so varied, and such a great code for understanding characters. Fortunately, a cartoon sandwich can be decoded rather quickly. Big, weird, gross, excessive sandwiches with oddball ingredients signal that the character is a goofball. Shaggy and Scooby turn impossibly tall sandwich love into a buddy comedy of greedy, self-indulgent behavior that depicts a child’s view of a teenager so powerful he can go where he wants in a psychedelic van with his friends and eat what he wants—then react like a big chicken when confronted with spookiness, which is what most of us in the audience suspect we would do if a luminescent diver ghost was advancing toward us. We know we would be like Shaggy even though he’s a doofus coward—and we know how he’s going to behave even if the first time we ever saw him was eating that Dagwood sandwich. And of course, the Goofball Revelation is most famously true of Dagwood Bumstead, who many decades ago gave that big, impossible sandwich his name by constructing un-eatable, sloppy piles of meat, cheese, bread, and God knows what. Everybody gets what the pile of sandwich is saying about Shaggy and Scooby or Dagwood without thinking too hard about it—it’s a sign of whimsical invention, carefree self-indulgence, creativity, selfishness, undisciplined hedonism, obsessiveness, and in Dagwood’s case the sandwich hints at the man’s unrealistic but surprisingly effective ambition that netted such a knucklehead a wife like Blondie. Nobody thinks about all those things consciously when they talk about a “Dagwood sandwich,” but they get all that even when they’ve never read Blondie. Frustrated attempts to eat a sandwich quickly demonstrate the difference between Tom of Tom And Jerry, and Warner Bros.’ Sylvester The Cat. The basic, Three Stooges-like violence of Tom And Jerry can’t be better illustrated than by the classic “Jerry the Mouse subs out the sandwich makin’s at the last minute with Tom’s tail, which Tom then bites painfully.” They’re Itchy and Scratchy. But Tom and Jerry’s sandwich high jinks contrast with Sylvester’s latest failure to trick Tweety, and show the patience that Warner Bros.’ directors credits audiences with. This Tweety sandwich establishes pace: Sylvester’s hubris when he invents the Sandwich Game has the usual dooming effect of an unwarranted sense of superiority—although the result is just that he underestimates Tweety and fails, instead of getting hurt. It’s too early in the episode for pain: Warner Bros. directors like to work up to that. Also, the sandwich shows us how Tweety is possibly the most obnoxiously disingenuous cartoon character you can think of—by the end of the cartoon, we usually get a wink or a clue that Tweety is fully aware of how far he can lead Sylvester into making a fool of himself. Sylvester’s Sandwich Game is not as slam-bang as Tom and Jerry’s sandwich gag, but it is typical of Merrie Melodies. It’s a lot more nuanced by comparison. Sylvester eventually seems like a tragic figure; Tom’s just outwittable. Popeye’s creator, E.C. Segar, set himself a difficult task by making spinach, a food kids perennially hated, the secret to Popeye’s success. Segar did manage to increase spinach sales in Popeye’s early days, but Popeye still has to confront the fact that kids hate spinach and love burgers. And the most skilled moocher of them all, Wimpy, will gladly pay you Tuesday for a hamburger today. He won’t even pretend to intend to give you anything for a can of spinach. Burgers are the ultimate sandwich. And Krabby Patties are, of course, the ultimate burger—a closely guarded secret and the pride of both Mr. Krabs and his most enthusiastic employee, SpongeBob SquarePants. You can’t make SpongeBob’s total innocence and purity of spirit clearer than when he’s displaying his devotion to flipping burgers (or defending the secret of Krabby Patties against Plankton’s attempts at corporate espionage, giving another character the equal and opposite reaction to the same burger). A hamburger is the most American food. In cartoons, it’s come to be associated with total indulgence and dim behavior, from Archie comics to Family Guy. Archie’s Jughead is obsessed with hamburgers; Family Guy is obsessed with pop culture references. If burgers are an American icon, then, the entrepreneurial “beef artist” Bob Belcher is pretty much living the dream. A lot gets in the way of his dream, of course. But there are no finer puns for really great-sounding burgers than on this cartoon, and a key to understanding appetite and how it gets triggered is apparent in the difference between how evocative and interesting his burger inventions are and how they’re shown. It’s not necessary to show perfect-looking food for food to seem like it would taste great. It takes getting inside people’s imaginations. Bob’s whole approach to making his daily special is an manifestation of the way creative ideas overflow out of every moment of every episode, with dialogue packed so tightly with lines and puns and significant little reactions that the sense you get from the show is that there’s an urgent need to get and hold our attention, fearing that if our mind wanders for even a moment then we’ll be lost—the entrepreneurial approach to comedy. Comedy is a business, too. Bob’s Burgers basically uses his restaurant and the burgers as an excuse to have a show with great characters and a dense joke-per-second rate—but that’s not a surprise. Any sandwich on a cartoon is always more than just a sandwich. Upcoming: The only way to make this evening bearable would be to ask Andre a few questions.